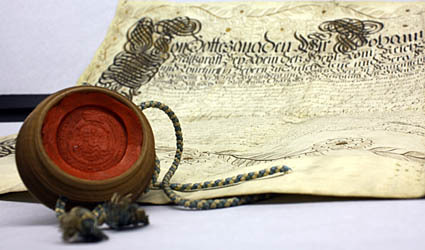 With the founding of Heidelberg University in 1386 came the problem of safekeeping the university’s charter and other legal documents. The first rector of the university, Marsilius von Inghen, answered this problem in 1388 by filing away the university’s annual income records in a chest, bought especially for this purpose, kept at the Church of the Holy Spirit. This could be regarded as the birth of the Heidelberg University Archive, although this course of action has none of the spatial considerations, independent institutional aspects, or reasoning that is associated with the archive today. A more sophisticated collection of records, including a greater variety of documents, did not appear until the time of Otto Henry, Elector Palatine, during the 16th century. In 1557 the archives were brought to the sacristy of the Augustinian monastery and were there reorganized. At the end of 1604, the archive was brought under the supervision of the University Council and kept in the “curia academica”, which had been created in the new Contubernium in 1583. The misfortunes that befell the Palatinate also left their marks on the archive. Due to the threats posed by the Thirty Years War the documents were moved first in 1621 to Heilbronn, and then later relocated to the Imperial City of Frankfurt am Main. They were eventually returned to Heidelberg in 1651, however the archive’s journey was not yet finished. Twice again, in 1693 and 1703, Frankfurt offered itself as a temporary refuge. Some of the University’s documents became victims of the French invasion and capture of the city in 1693, in particular archived records dating from 1662 through to 1689. By the 18th century, the archive suffered no more great losses. The administrative changes between 1800 and 1810 resulted in a transition of power and the university being run by the government. During this time the archive began to suffer from neglect and from 1830 on it had ceased to be maintained altogether. Though the archive process was regarded as being superfluous, the archive itself nonetheless comprised many historical and laudable records and it was considered necessary to transfer its management to another institution. In 1838 the Karlsruhe State Archive attempted to acquire Heidelberg’s archived documents. However, the University managed to retain possession and the documents were eventually transferred to the Heidelberg University Library in 1845, where they were to remain for over a century. In light of the archive’s biography it should come as no surprise that by the middle of the nineteenth century the internal order of the archives conveyed a sense of utter chaos. This was little improved when the university librarians in the manuscripts collection applied their methods to the papers and, viewing the bound documents as “codices”, integrated mixed printed material (such as legal papers, course catalogues, and address books) with their book inventories. It took until the end of the 19th century and the tenure of the first full-time director of the university library, Karl Zangemeister (1837-1902), before it was decided that the archive required reorganization. After some preliminary work in August of 1888, the rearrangement of the records began in earnest in January of 1889. Responsibility for this was later transferred to PD Dr. Adolf Koch, who was given a period of two years to complete the work, though it took until 1892 for the task to be completed after several different consultants had to be called in. The successors of the post of Archive Director after Zangemeister’s death in 1902 were: Jacob Wille (Library Director from 1912, and Archive Director until 1929), Rudolf Sillib (1929-1934), and Karl Preisendanz (1935-1945). After World War II, Prof. Dr. Hermann Finke led the archive as a stand-in director until his death on the 8th January 1947. With the appointment of Prof. Dr. Walter Peter Fuchs on the 15th November 1947 the university had for the first time a historian in the position of University Archivist, although the archive remained subordinate to the University Library. Fuchs filled this role until the summer semester of 1952 before handing the post over in August of that year to Hans Krabusch, who took over care of the archive as a secondary employment. After Krabusch’s departure in the autumn of 1962, the archive was supervised by a series of different auxiliary directors, with Prof. Dr. Ahasver von Brandt acting as a representative for the archive in the university senate for almost 12 years. In May of 1953, the archive was relocated to the southern wing of the New University building and gradually assumed an independent existence. The accommodation of the archive together with the History Department rapidly began to present spatial difficulties and so towards the beginning of the 70’s, during Dr. Hermann Weisert’s tenure as director, that the archive acquired rooms in the back building of the former Bezirkssparkasse, a bank on Friedrich-Ebert-Platz. Weisert, who was appointed as the first full-time archivist on the 1st March 1964, presided over the archive until 1988. During his long tenure, he wrote copious amounts about the history of the university and the sources found at the archive. The first high-caliber trained archivist to be given responsibility of the archive’s management was Christian Renger, who was followed by Prof. Dr. Werner Moritz from 1996 to 2010. 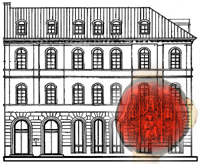 During the winter of 1998-99 the archive moved, under Moritz’s supervision, to its current location at 4-8 Akademiestraße. The current director, Dr. Ingo Runde, has been in the role since October 2010. Throughout its history the archive’s collections, as primary sources, have been used to present and explain the history of the University and its context to the outside world – a process which continues to this day, particularly around anniversaries. In the 16th century Georg Sohn, a professor of theology, evaluated the document collections of the archive for his comprehensive “Oratio historica de fundatione et conservatione laudatissimae Academiae Heidelbergensis.” Later, in 1886, Eduard Winkelmann presented the two-volume matriculation register, written and compiled by Gustav Toepke, for the 500 year anniversary of the university. It was in 1945 that the university archive once again suffered considerable losses in regards to its more recent documents, caused displacement or through interference from the occupying forces, and examples of documents that are yet to be found include other volumes printed by Winkelmann. The so-called “New Collection,” which contains some 1500 vellum documents, was transferred from the university library to the archives in 1955. Collections of manuscripts, notes, correspondences, and other unpublished and unofficial personal papers that have been left to the university (German: Nachlässe) were housed almost exclusively in the university library until the mid-1990s but have since then, through a special agreement, become the responsibility of the archive. The indexing of the older documents up until 1969/70, the year that the new university constitution expanded the number of faculties from 6 to 16, is largely complete, whilst the indexing of the newer collections is, naturally, still a work in progress. When it was last calculated in April 2010, the archive spanned a cumulative 4,100 square meters. The main focuses of the archive today are the acquisition and processing new documents, curating the Nachlässe, and maintaining the image archive, as well as over 11,000 student records. Private enquiries concerning genealogy are also common, as the archive has original student records, including registration forms, starting from 1880. Structurally, the archive’s most recent development has been to reorganise its set-up and, in spite of its relatively small staff and budgetary resources, it now uses modern information, communication, and reproduction techniques to function primarily as a service organisation, whilst endeavouring to maintain good public relations through lectures, guided tours, and publications. In this way, and as a part of a network of cultural institutions in Heidelberg, the archive hopes to awaken or further public interest in Germany’s oldest university and its history. I. Runde, Das Universitätsarchiv Heidelberg. Von der parva archella zum modernen Archivbetrieb, in: Universitätsarchive in Südwestdeutschland. Geschichte – Bestände – Projekte. Tagung anlässlich des 625-jährigen Jubiläums der Ersterwähnung einer Archiv­kiste der Universität Heidelberg zum 8. Februar 1388 (Heidelberger Schriften zur Universitätsgeschichte 1), hrsg. von dems. (2013), S. 47-71.